Demolishor is the name of several different fictional characters from the Transformers series. Demolishor is one of the earliest created Decepticons of the toyline; and in the storyline, also one of the first to come to Earth from his homeworld - the fictional planet Cybertron. In the Japanese series, Demolishor's name was Ironhide, later Irontread and also later Ironside. Demolishor was a regular character in the show and one of Megatron's most faithful troops, whose loyalty to his Lord was always beyond any doubt. His transformation was that from a robot to a self-propelled track-laying multitube gun (indeed, a sort of a Cybertronian tank). He was extremely strong and acted usually in conformity with the principle «big strength is better than big brains», especially when it was necessary to crush or destroy something. He was of a serious and rather morose disposition. He mostly acted as the muscle of the group, partnered with Starscream and Cyclonus to battle the Autobots. When meeting the 'Bots in single combat, however, he often lost because of his sluggishness. Demolishor played no major role in the series aside from acting as Megatron's favored military tactician, prior to Thrust's arrival. In spite of his rough and grumbling nature, he was a true mate. Though Demolishor obviously had little liking for Starscream (and even fought him several times), he interceded for him with Megatron and saved his life twice, at any rate. Once Demolishor saved Starscream by cutting the power ropes the latter was bound with, when Red Alert and Smokescreen attacked him in the forest and tried to disarm him. However, after doing this, he declared to Starscream (who was surprised very much by such a friendly service) that he saved not him but the Star Saber (Episode 17, "Conspiracy"). But possibly Demolishor's most important act during this period was to smash through the doors of the Decepticon base at one point to save Starscream from Megatron's wrath ( Episode 23, "Rebellion"). In episode 43, "Puppet," he was heavily damaged by Nemesis Prime. Thanks to the Mini-Cons, he and several other Transformers got powerlinx upgrades, which meant he was much more powerful. His new color scheme of red and white was meant as a tribute to his Japanese namesake Ironhide and his new colors were a homage to G1 Ironhide. He fought against Unicron along with Optimus Prime, Galvatron, Jetfire, Tidal Wave, Hot Shot, Sideswipe and Cyclonus after Starscream was destroyed by Unicron, and was one of the few to survive the final battle after Galvatron sacrificed himself to end the war. His Mini-Con partner was Blackout. Demolishor was very fond of him and even risked his neck when Blackout was in danger during the battle with Unicron. In the show Transformers, after the battle with Unicron 10 years prior, Demolishor continued to follow the final order given by his presumed dead leader, Megatron to work with the Autobots, similar to what Starscream did in Transformers Armada, and was appointed a guard at Ocean City, one of the joint human/Cybertronian Energon mining operations on Earth. Despite frequent conflicts with some of the Autobots there (especially Ironhide) and an unwillingness to follow the orders of Optimus Prime, throughout the series. Especially, when it meant he was left out of the fight, he generally served well, fighting strongly against the early Terrorcon attacks. However, later in the show, when Demolishor beheld the sword wielded by Scorponok that had been forged from Megatron's spark, he could sense his leader's life energy, and found himself questioning his role. When Megatron himself was reborn and attacked Ocean City, Demolishor faced off against his leader, but could not bring himself to fire upon him, returning to his side. Though this far through the story, there were still some lingering doubts in Demolishor's mind, his experiences with the Autobots and humans clearly having affected him. He made his final decision, however, when he cast his concerns aside and pushed Megatron out of the path of Miranda II's Energon Grid, taking the full force of the energy, destroying his body. However, Megatron was able to recover his spark, and using the powers he gained by merging with Unicron's body, created a new body for him, bringing Demolishor back into the plot. As sort of a final insult, Megatron diminished his intelligence, turning him once again into a loyal servant. Prior to this reconstruction in the show, Demolishor retained his original form of a missile tank (only now colored Constructicon Green), but after being recreated, his alternate mode became a dump truck, armed with a "Hyper Power" missile launcher. In this new form he was renamed Irontread in Transformers: Superlink, the Japanese version of the series. His new personality was highly aggressive and combative, and he would often perform backflips and beat his chest when excited. Despite his brainwashing, when Galvatron (the upgraded incarnation of Megatron) plunged himself into an Energon sun to prevent Unicron's victory, Snow Cat (Cyclonus' similarly upgraded form) and Demolishor were self-preserving enough to hold back and stay alive while their leader, Starscream and Mirage apparently perished. Demolishor appeared regularly in the Transformers: Armada comic book series by Dreamwave Productions. Where other characters like Thrust and Starscream had a much smaller role in the comics, Demolishor's role was fairly accurate to his animated series role, mostly acting as the dim-witted muscle of the group. He was one of the elite strike force that took over Cyber City, but was unable to prevent the escape of most of the Mini-Cons. One million years later, when the Mini-Con signal reached Cybertron, he was one of the elite group of Decepticons that came to Earth to find them, acquiring the new alternate mode of a tank and battling the Autobots. Demolishor was slightly more ambitious in this continuity, aiming to capture Mini-Cons to supplant Starscream as Megatron's lieutenant. He took part in many of Megatron's subsequent schemes, such as attempting to capture more Mini-Cons and battling Red Alert. He was subsequently left behind when the other Decepticons attacked the Mini-Con base on the moon, but was with Megatron's troops when they attempted to acquire Over-Run's ship - only to encounter a surprising enemy: Generation 1 Galvatron, who made short work of Thrust while Demolishor and Starscream escaped. Subsequently attacking the Autobot base and taking out Scavenger and Smokescreen, he was himself taken out by Galvatron. Unlike most of the Decepticons damaged by the Herald of Unicron, Demolishor was shown to be reactivated, presumably working with the Autobots to fight Unicron, after which he was shown celebrating. Demolishor would only make a few appearances in Energon, mainly in Energon #28, where he was shown to have successfully worked with the Autobots since Unicron's defeat in an Energon plant, and was one of those who aided the Autobots when Cybertron was attacked by the Four Horsemen of Unicron - Airazor, Cheetor, Rhinox and Terrorsaur. While working at the plant one night, he was attacked and drained of his energy by a mysterious phantom - Starscream, who had been nearly killed by Scorponok, but had become a ghost composed of Energon. Demolishor would make one more appearance in flashback in Transformers: Energon #30 as one of the Decepticons piloting Megatron's battle barge as Starscream delivered a warning of Scorponok's ambitions. Although no more Energon comics were produced after issue 30, Transformers comics writer Simon Furman posted images of the planned Energon #32 issue in which the cover shows Demolishor in his new form. In the story, Furman planned for Demolishor to be re-booted and upgraded by Alpha Quintesson and working as one of his agents, where he fights Kicker. His Mini-Con gimmick was that he could fire the missiles from his shoulders. There is a prototype of the Armada Demolishor known to exist. His upper part is cast in bright yellow and dark blue and the legs are done in production colors, it has black missiles and has no minicon. There are a couple of unpainted testshots, but this is the only known prototype in unproduced colors known to exist. In 2003, he received a Powerlinx upgrade which was a straight recolor of his original toy. This toy was repurposed as Shattered Glass Demolishor. Demolishor also appeared in Built to Rule during 2003 in his original color scheme and also a new "Night Attack" color scheme in 2004 that did not originate from an actual Transformers toy. Demolishor had two different toys in Energon. The first was a straight repaint of his original Armada toy. A homage to Generation 1 Long Haul. Demolishor is a Hasbro exclusive straight repaint of the Armada toy in jungle-style camo and did not come with his Mini-Con partner Blackout. Instead, he came with a remolded Cybertron Cyber Key which had a Mini-Con port which would activate his missile launching gimmick. Being created by Hasbro after the TV series had finished by Takara, Demolishor does not appear in the television series. The bio provided indicates he stayed behind on Cybertron when it was abandoned, battling endlessly against the hordes of Scrapmetal Terrorcons. Surprisingly, given his actions in Energon, he is not too keen to reunite with Galvatron, having a happier time of it not being kicked around by the Decepticon leader. In the Japanese version of Transformers: Cybertron, Mudflap was the name given to Demolishor. He has no relation to the character Demolishor from Armada and Energon. General Demolishor is a Transtech Military Police officer on Transtech Cybertron. He is a pompous, over the top, blowhard who enjoys using excessive force. Demolishor appeared in Withered Hope by Fun Publications. He killed Escargon while attempting to recover stolen transport passes, then later attempted to arrest several Gobots who he suspected were involved. He proved to be nearly unstopable in a battle with the six Gobots and Crystal Widow, withstanding all their attacks, but was eventually arrested for assault with the use of unauthorized lethal force against the Gobots. Demolishor is a member of the heroic Decepticons commanded by Megatron. Unlike most of the inhabitants of the Shattered Glass Cybertron, Demolishor seems to be a mirror reflection of an Armada character instead of a Generation 1 character. Unlike the Armada character who is very determined, this Demolishor seems to be a bit wishy washy, not sure what he should do or why. Demolishor appeared in "Do Over" by Fun Publications. He volunteered to be a member of the crew of the Decepticon starship Nemesis because he figured Earth had to be better than the war torn Cybertron. Although Cliffjumper was suspicious of him at first, he allowed Demolishor to become a member of the crew. He was presumably on board the Nemesis when it launched to follow the Autobot's Ark and was among the crew when they ejected in escape pods to the planet Earth. He is later revealed to be part of a faction of Transformers-also including Jetstorm and Sideburn-with ties to the Underbase. Unlike most other Transformers named Demolishor, this character from Revenge of the Fallen turns into a construction vehicle. Demolishor is cowardly when there's no leader, and he isn't the brightest one, but he's powerful enough to fight with multiple foes. He can use his excavator mode's tracks as wheels to travel (either as a unicycle or bicycle) and attack by moving one over his head to crush everything in front of him. It should be noted that although Demolishor's alternate mode is a construction vehicle, he is not part of the Constructicon subgroup; rather, he is an individual Decepticon who happened to choose a similar guise to Scavenger (who is a Constructicon). Demolishor protects a small Decepticon community in Shanghai after Megatron's death. He is the largest non-combined transformer seen in any of the Michael Bay films so far, although there are larger characters in the associated media. Demolishor shares his model with another Decepticon, Scavenger. This led to confusion for several months by fans if Demolishor and Scavenger were the same character or different. In the film Demolishor is depicted as being primarely white, while Scavenger is red, but as Demolishor is seen only at night, his color is hard to see. Additionally most of the toys for Demolishor are incorrectly colored red, like Scavenger, making them nearly identical. In the novel version of Revenge of the Fallen this character's name was spelled "Demolisher." It is also spelled this way in several children's novels. Demolishor was seen in Transformers: Defiance issue #4. He was seen in a flashback in the Fallen's story of the species' origins alongside the Constructicon Mixmaster. Demolishor was presumably one of the second wave of Decepticons sent to Earth by Soundwave in Transformers: Alliance #4. He reveals himself and goes on a rampage in Shanghai, China at the end of issue, just as the Autobot deploy to take care of him. Demolishor was spotlighted in Tales of the Fallen #2, where he arrives on Earth and fights Sideswipe. 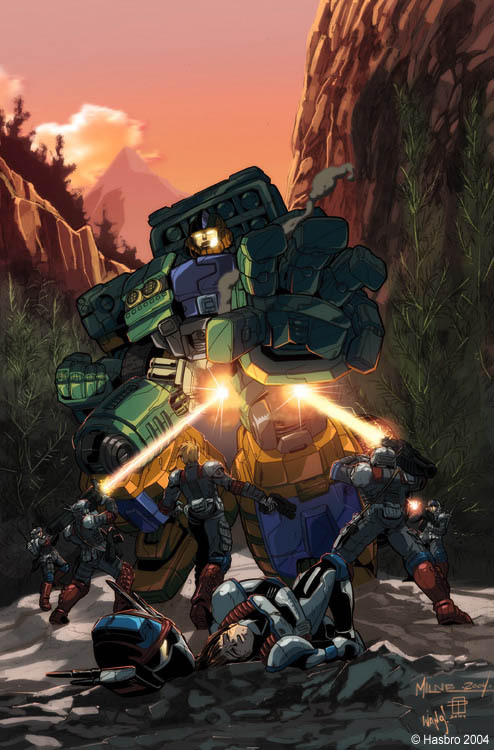 In the comic adaptation of Revenge of the Fallen Demolishor is depicted as being a smaller excavator, more the size of Optimus Prime. He also rampages through Shanghai in vehicle mode complaining of the human "infestation." He only assumed robot form just moments before he is killed by Optimus Prime, and isn't seen very clearly. In this version he does not speak of the Fallen before he dies. As Scavenger is depicted as looking more film accurate in later issues, Demolishor and Scavenger are not identical in the comics. When the NEST and the Autobots come to Shanghai, China attempting to uncover a hidden Decepticon they find Demolishor and Sideways. Demolishor transforms and swats at NEST helicopters as he begins to make himself mobile. Demolishor proceeds on a highway in China. He destroys an overpass just as Optimus Prime transforms and jumps off the bridge. Optimus manages to dive onto Demolishor, grabbing onto his head as he proceeds down the highway. Optimus shoots him repeatedly in the head, while at the same time Ironhide damages one of his wheel joints in which breaks the wheel forcing the Decepticon to fall over, causing him to go off road and crash. With most of his body damaged as a result, Demolishor's last words are "This is not your planet to rule. The Fallen shall rise again" before Prime kills him by blasting him through the face. Demolishor appears in the Transformers: Revenge of the Fallen Xbox 360, PS3, PS2, and Wii versions as a boss, but is not a playable character. He is incorrectly portrayed as red here too. He is listed in the credits for Transformers Revenge of the Fallen: Autobots game for the DS, but does not appear. His vehicle-mode tracks turn into wheels in robot mode; one of the wheels can be placed on his back or above his head. The Demolishor toy is actually colored red, like Scavenger, as opposed to his mostly-white coloring seen in the movie itself. This toy appeared on the cover of the Transformers Collectors Club magazine issue #26. This toy made some top toy list of the Christmas 2009 season. A film-accurate white redeco of the initial Voyager toy. A film-accurate version of Demolishor that can become the torso of Devastator. Demolishor is a downloadable character for the 2010 video game Transformers: War for Cybertron. Demolishor returns in the sequel to War for Cybertron, but only playable in multiplayer, and not mentioned at any point during the campaign. ↑ Furman, Simon (2004). Transformers The Ultimate Guide. DK Publications. p. 121. ISBN 978-0-7566-3012-6. ↑ "Transformers Energon #32 cover" (JPG). Archived from the original on 2007-11-11. http://web.archive.org/web/20071111141203/http://seibertron.com/images/comic/25/032a.jpg. ↑ "Transformers Energon Armaggedon (Issues 32 and 33) - Transformers News - TFW2005". tfw2005.com. 2010-12-02. http://www.tfw2005.com/transformers-news/comics-16/transformers-energon-armaggedon-issues-32-and-33-171030/. Retrieved 6 May 2015. ↑ Furman, Simon (2010-11-28). "Energon Archive (4)". Simon Furman the Blog (Wordpress). https://simonfurman.wordpress.com/2010/11/28/energon-archive-4/. Retrieved 6 May 2015. "In the Mojave Desert, Kicker is fighting Demolishor (re-booted and upgraded by Alpha Quintesson — now one of his agents). At first, Kicker thinks he can handle Demolishor, until that is Demolishor shrugs off Kicker’s energon blast. Clearly, Alpha Quintesson has tailored him for just this mission." ↑ S. Trent Troop & Greg Sepelak (2008). Withered Hope. The Transformers Collector’s Club. ↑ "First look: Robo-brawlers big, small in new 'Transformers' - USATODAY.com". usatoday.com. http://www.usatoday.com/life/movies/news/2009-04-01-transformers-first-look_N.htm. ↑ "Transformers 2: Super Bowl Teaser is Only The Beginning; Constructicon Details Revealed | /Film". Slashfilm.com. 2009-02-03. http://www.slashfilm.com/transformers-2-super-bowl-teaser-is-only-the-beginning-constructicon-details-revealed/. Retrieved 2013-07-19. ↑ "Cover". Transformers Collectors Club (Fun Publications): p. 1. April–May 2009. ↑ "Demolishor in Transformers: Fall of Cybertron". deviantart.com. http://mediziner.deviantart.com/art/Demolishor-in-Transformers-Fall-of-Cybertron-364990600. Furman, Simon (2004). Transformers: The Ultimate Guide. DK Publishing Inc.. p. 120. ISBN 1-4053-0461-8. This page was last modified on 30 April 2016, at 22:10.